Thank you for visiting our website and for coming to this page to learn more about our story. We also invite you to check out our blog, which will include frequently updated news, testimonials, material and fun stuff, centered on the preservation of very important stories and memories. We are two sisters, Joanne and Kathy, living in Florida and Iowa, both happily-retired elementary school teachers. Along with our favorite roles as busy wives, moms and grandmas, we enjoy managing our business from our home-offices, and traveling often to meet as we continue to write and develop more memory journals for our customers. LINKAGES began in 1992 when Kathy made a booklet for her Kindergarteners to give to their grandparents. The purpose was to collect Grandma and Grandpa's stories about what life was like when THEY were 5. This project was so well-received by everyone that Kathy saw a need for such a gift product, and the concept was born. 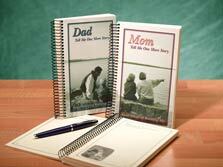 “Grandma Tell Me Your Memories” and “Grandpa Tell Me Your Memories” were the first of their kind question-a-day memory journals, where the writer is asked to recall stories from childhood and youth. With a little writing each day, the journal is meant to be completed in one year. Kathy enlisted the help of her husband and her sons to write the questions, and it became a family mission to create journals that would encourage others to be the authors of their very own childhood memoirs. Beginning with modest printings of 500 per title of the Grandparent journals, and the subsequent addition of “Mom Share Your Life With Me” (and Dad Share...), this concept has grown into a partnership whose self-published journals have sold over 1.5 million copies across the nation! In 1994 Kathy, Joanne, and sister-in-law Susan developed the 3 Memory Journals for Children, with each author writing for the age group that she taught. Consequently they are especially proud of the variety within this little series, and the age-appropriateness of the questions on each page. That was the beginning of the ShoeStrings company, with Joanne and Kathy as partners. They love to use their business as an excuse to get-together for travel and interesting creative sessions, which have resulted in 4 additional titles and more on the way! “Mom Tell Me One More Story” (and Dad Tell...) take a different approach and ask a parent to write about THEIR CHILD'S childhood-- the memoirs of raising that child. And of course, it was only natural that the two sisters would move on to create journals for Sisters. "Sisters....A Journal About Growing Up Together” is a larger Heirloom-type journal in the Question-A-Day Format with room for lots of story-telling. The newer, more quirky and colorful "Sisters....A Journal of Memories" is much smaller, and quicker to complete. Besides “having” to get together frequently for business, Joanne and Kathy especially enjoy all the letters, emails, and phone calls they receive from happy customers, each with a different touching story about how a completed Linkages or ShoeStrings journal has become a treasured keepsake and impacted a whole extended family. We are blessed to enjoy a business that is a gift to others, and the stories we get continue to be a gift to us. We would love to hear from you ! Kathy Lashier and Joanne Farrell.